More than two dozen projects throughout the country include restaurants, homes for the abandoned and vulnerable and a supermarket. BEIRUT — Blessing himself as he settles in the driver’s seat of his small car, which serves as a makeshift office, Father Majdi Allawi sets out to visit and serve at several initiatives of Bonheur du Ciel, the charity he founded. Each day, he covers a different area of Lebanon. It’s 7am. “I pray the Rosary so Mary holds my hand,” he says of his one-handed driving style as he patiently inches through never-ending traffic. Formally established in 2008 with a drug-rehabilitation center, Bonheur du Ciel’s mission has blossomed to 28 projects throughout the country, including eight restaurants serving free meals, a home for the homeless, a safehouse for battered women, a home for abandoned babies, an orphanage, two homes for “forgotten” elderly, a bakery, a supermarket and even a hair salon. “I would like to ask people, ‘Have you ever gone to sleep hungry or slept on the road?’ If we don’t accept that for ourselves, how can we accept it for others?” the wide-eyed, soft-spoken Melkite Catholic priest tells the Register of his hope that all would help the poor and needy. As Lebanon sinks deeper into an economic crisis, exacerbated by a refugee population of nearly 1.5 million from neighboring Syria, more and more of the country’s inhabitants are facing a bleak existence. First stop on his rounds is Heaven’s Joy free bakery in Beirut’s crowded Bouchrieh section. It offers manoushe, a Lebanese flatbread popular at breakfast time, typically topped with olive oil, oregano and sesame seeds. Father Allawi chose the location because he realized that children attending two public schools were beginning their schooldays on an empty stomach. “How will they study and pass their classes?” he asked. 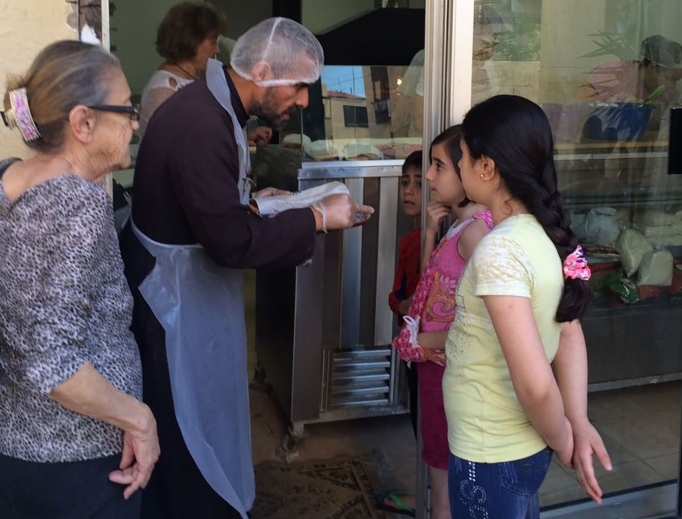 Upon arriving at the bakery, Father Allawi greets a group of children, patting their heads, “Have you had your breakfast? What would you like?” he asks them. Setting to work assisting the volunteers behind the counter, the priest begins to prepare the manoushe and pops them into the oven. In just about two minutes, the batch is steaming and ready to enjoy. On a typical morning, 350 guests are served by 8am, reaching up to 900 servings each day. Outside, an overwhelmed mother looks on helplessly as the bickering of her small children intensifies. Father Allawi appears at the right moment. “Bon Jour,” he says, stooping down with a smile, as the children look at him calmly with eyes full of wonder. Soon, they are nourished. A thin elderly man with torn sneakers and soiled, baggy pants arrives as Father Allawi wipes down the few outdoor tables. Pulling out a chair, he offers the guest a seat with a kind smile. Heaven’s Joy serves all people, regardless of their religion or nationality. “Hunger and suffering know no boundaries,” emphasizes Father Allawi, who was born a Shiite Muslim, converted to Christianity at age 9 and was baptized a Catholic the same year. He was ordained a priest in 2005. The priest’s next stop is Heaven’s Joy free supermarket, also in Beirut’s Bouchrieh neighborhood. The once-a-week market serves 1,500 families each month, offering fresh produce and a range of staples, including rice, dried beans and lentils, pasta, cooking oil and powdered milk. Each family is issued a “debit” card in advance, in which family size determines the number of items that can be “purchased.” The act of selecting and seemingly “purchasing” grocery items gives the family dignity, Father Allawi says. The center also boasts a one-room mini department store offering new and gently used clothing for all ages, as well as toys, household necessities and furniture. Patrons are invited to choose without limit. Ahead of the 9am opening, women volunteers chat and laugh together, as every detail in the store is already organized. When Father Allawi arrives, they are like a reunited family and enthusiastically proceed to the chapel, steps away from the entrance. Every Heaven’s Joy center has a chapel. “No church, no center,” the priest points out to the Register. Beginning with a hymn to the Blessed Mother, Immaculate Mary, they fervently pray the Rosary together. Among his intentions, Father Allawi asks for an outpouring of the Holy Spirit, for blessings upon all the people who visit the supermarket, for the sick and for the poor. Little 16-month-old Rasha, visiting from the nearby Heaven’s Joy home for abandoned babies, delights in the love poured out from the volunteers who dote upon her as they pray, a glistening rosary wrapped around her tiny wrist. In an adjoining room beside the food market, a group of patrons has already gathered, waiting patiently. Their weary, worn faces lighten when Father Allawi enters, welcoming them. Together, they pray the Our Father and Hail Mary and sing a song to the Blessed Mother. “May God give you a long life,” a middle-aged woman tells the priest as he accompanies them to the market’s entrance. “Pray for me,” he requested. With a big smile, a volunteer hands out blue shopping baskets. Soon, Georgette is ready for the checkout counter, her shopping basket full of produce and basics for food preparation. With soft eyes and her delicate features etched with worry lines, the 60-year-old woman seems beyond her age of 60. “I have four children. My daughter is very sick, and her husband has no work, and neither does mine. I have so many problems, but I feel happy when I’m here,” she tells the Register.